SCVHistory.com LW2813 | Melody Ranch | Lobby Card: Gene Autry in 'The Big Sombrero' (1949/1956). 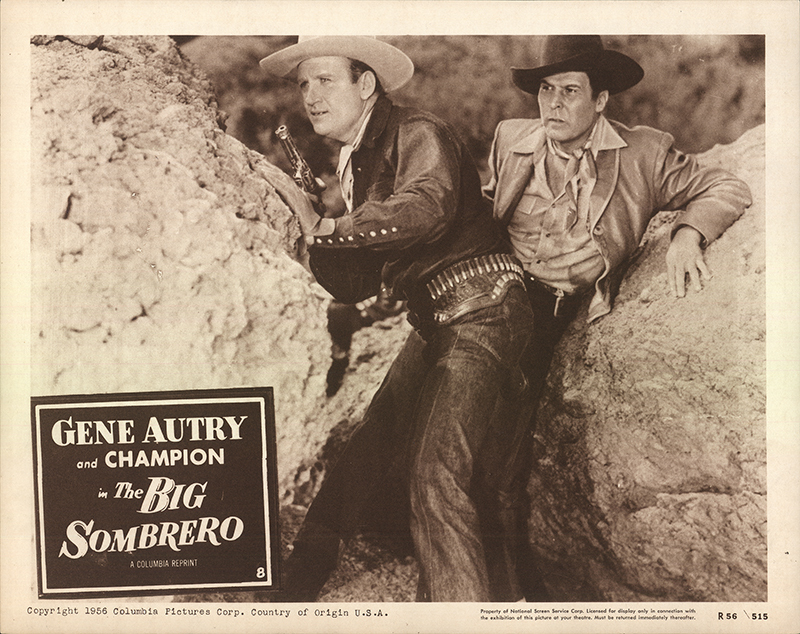 Gene Autry in "The Big Sombrero"
Lobby card (sepia, 11x14 inches) advertising the 1956 re-release of "The Big Sombrero" (Gene Autry Productions/Columbia Pictures 1949), starring Gene Autry and Champion (2nd billing) with Elena Verdugo, Stephen Dunne, George J. Lewis, Vera Marshe, William Edmunds, Martin Garralaga, Gene Roth and Neyle Morrow. Uncredited cast includes Jose Alvarado, George Bell, Sam Bernard, John L. Cason, Joe Dominguez, Robert Espinoza, Lynn Farr, Antonio Filauri, Joe Kirk, Pierce Lyden, Alex Montoya, Artie Ortego, Joe Palma, Jose Portugal, Cosmo Sardo, Charles Soldani, Tony Urchel and Rian Valente. Produced by Armand Schaefer, directed by Frank McDonald, written by Olive Cooper (screenplay). Santa Clarita Valley locations include the Monogram Ranch (later known as Melody Ranch), Vasquez Rocks, and the movie ranch now known as Rancho Maria at 25933 Sand Canyon Road. Additional locations include Corriganville (Simi Valley), Red Rock Canyon State Park (Cantil, Mojave Desert), and Starr Pass in Tucson, Ariz.
LW2813: 9600 dpi jpeg from original lobby card purchased 2015 by Leon Worden.